Jason Fowler, pictured here, won the handcycle division of the 2009 Ironman World Championship in Hawaii. (CNN) – The first suspect in the Boston Marathon bombings is dead. The second has been caught and now faces a trial. But the wounds from that horrific day have not healed. More than a dozen victims had one or both legs amputated. Their lives forever changed. In many ways, Boston's own Jason Fowler knows what that's like. He did race this year's marathon, but not by running. Instead, he was in a wheelchair. In 1991, Fowler lost the use of his legs when he was 17 following a motocross accident while getting ready for his first professional season. Although his motocross career ended that day, it would turn out to be only a minor speed bump in his racing career. Fowler would eventually become an Ironman champion in 2009, but that came after a long road of recovery and adjusting to a new way of life. [5:20] "I know my injury is very different in the way that it happened with a motorcycle and really being my own fault. But I would say that it's similar in that you have to move on. One of the toughest things is taking that first step, and that's going to be really scary. It's going to be really scary to learn to live with and come to terms with what other people would call a disability. I would tend to call it an 'ability' because it's going to enhance other senses and give you a quality of life that is very different. " 1)The recent victims of limb loss haven't had enough time to begin to emotionally process their personal losses. Someone who has had decades to come to terms with his loss and "move on" isn't a fair comparison or measuring stick for the fresh pain of loss of limb(s). 2)Like when well meaning people say, at the funeral of your mother who died only days ago, for instance, "I know just how you feel because I lost MY mom back in 1990...", for instance, it feels like they are minimizing your pain and loss as well as seeming rather matter of fact about her death as a rather common experience that can easily be gotten over in time. I won't argue that perhaps the grief of loss is common and can be overcome, but certainly not in the beginning and most certainly not because someone says it is so because they have experienced a similar loss some 20 years ago. 3)Loss is different to each person and because one man could overcome it and become a champion wheel chair racer certainly doesn't mean this will or can be a likely outcome for the next guy. Even if the eventual outcomes are comparable, it won't seem that way to someone suffering a new or recent loss as great as a limb(s) or the use thereof. 4)Although he does mention the type of loss and circumstances of his injury are different than those whose limbs were lost at The Boston Marathon, I'd dare say that was a gross understatement, indeed. His 22 year ago, loss of the use of his legs, and via an accident, in NO WAY compares to the trauma of having one's limbs literally blown off in a terrorist attack, none what so ever. 5)He and others speak of, "...taking that first step", when most of these victims' stumps haven't even healed yet. I'd find "move on" types of rhetoric a bit difficult to swallow when there were still stitches where my leg used to be and I hadn't yet even gotten over the shock of what had happened yet. While these types of inspirational stories can be eventual excellent sources of comfort and hope and invaluable aids in victim recoveries, they'd be much better received at a more appropriate time and much later in their recoveries, NOT in the first few weeks following such a horrific and traumatic event while a victim is still grieving and trying to come to terms with the surreal reality of their loss. Hey Kim, I am the producer of this story and I REALLY appreciate your response. Clearly very well thought out. I can't say I thought of every point, but certainly some crossed my mind. I understand little time has passed for the victims, but with all the focus on the suspects I felt it was worth keeping the struggle of the victims in perspective. Yes, Jason's injuries are different and not everyone will go on the become an Ironman. But I felt the point of sharing such achievement is to say not only can you recover from this horrible event but you can go on to do great things if you so choose. And also yes, it must be tough to get that "move on" advice. But I flat out asked Jason if he wanted to do this and if he felt it could perhaps help someone. He said yes. And When he called his injury an ability because it gave him a new perspective on life not many obtain, I was moved to tell his story. He and I both felt it was worth a shot to offer some sort of encouragement. It was a horrible event that happened and I felt like trying to do something positive. I don't expect this quick response to change your mind and that is ok. I am glad you wrote down your thoughts and shared them! Thank you! Tim, the point that you are making has nothing to do with what the guy is saying , perhaps you should look at the facts of this mans words and meanings of life without he's legs and how he had to learn how to move on and go forward as we all do but guess you are NOT human like the rest of us HUH. Ironically, the wheelchair is much faster than legs in the marathon. In fact, for any race over 800m in distance, the wheelchair wins. At the marathon, the contest isn't even close, with the world record being 1:18 using a wheelchair versus 2:03 using legs. 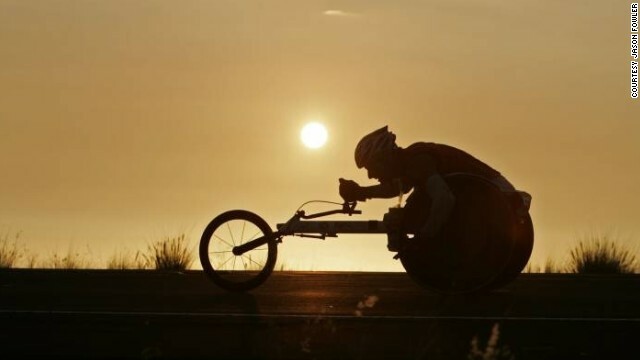 I am told that wheelchair marathons are inherently biased in favor people who are bilateral amputees (as oppose to people who just lose the use of their legs), because the most advanced models have the racers tugging their stumps beneath their body to create an aerodynamic shape. People with legs cannot sustain that shape. What does your comment have to do with the article? It wasn't about being faster. It was about getting back up and moving forward. I think you missed the point, the article is not about racing or sport at all really. Are you a robot or something? Tim, your point may be interesting but it is not at all what this gentleman is trying to communicate. Did you listen to the recording? It seems that you did not do so. Perhaps you should do, it would make a large difference in your response.